Transform your backyard into a quaint French cafe with this cast-aluminum bistro set. 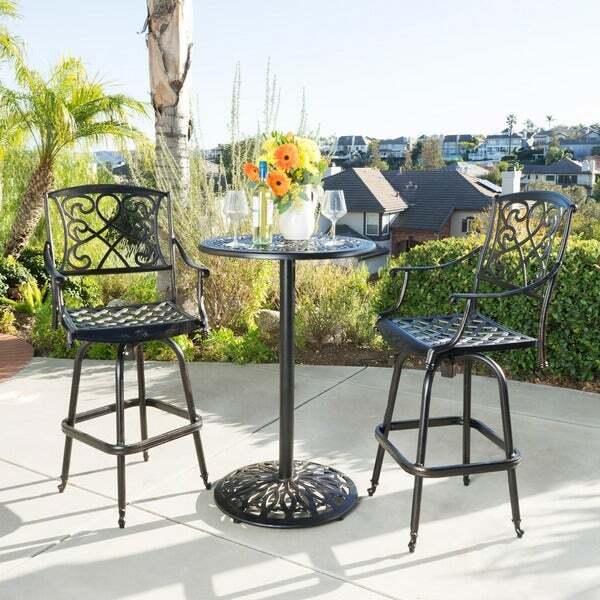 Featuring a pub-height table and two armed chairs, this compact bistro set works well on a patio or next to your swimming pool. Ornate metalwork and a shiny copper finish give this set a classic look, making it perfect for enjoying a morning cup of cafe au lait with a friend. The product looks exactly as it did on the website. But it wasn't all cast aluminum. The chairs are c/a, but the table has some steel and it could rust in the upcoming years living in a humid environment next to a pool. But it does look good and it is comfortable. One of the chair legs was not equal. I had to put some felt underneath to keep it from rocking. This Santa Maria Shiny Copper Cast Aluminum 3-piece Bistro Bar Set by Christopher Knight Home is a pretty decent set. The chairs are painted aluminum, but the base (which is very heavy and very sturdy), and the parts that allow the chairs to turn are painted steel and therefore rust. I have these on a deck very very close to the ocean, and like most things, they held up okay in the salt air for the first year or two, except the table base needed to be naval jelly'd and painted a few times -- something I was hoping to avoid bu buying "aluminum." One of the chairs is rusted so that it won't turn now. After a bunch of WD40 it turns with effort. The chairs are peeling now and I am letting them peel to expose the oxidized aluminum. Hopefully they will all peel soon and look uniform, if gray. I continue to put naval jelly on the rusty chair pivot and table base, and paint the table base as needed. Please note: my sea-air conditions are extreme, and as I said, the paint on the aluminum held up well for a good while under harsh conditions. The only bummer was the steel base and other selected steel parts, which I didn't realize when I bought it. I might have gone a different route had I known. I have been searching for a quality outdoor bistro bar set for some time now. I saw this and looked at the price, bought it and won't expecting much. After we received and assembled the pieces - I was very happy with the purchase. The assembly was very simple, its is extremely comfortable and very well made. I would definitely recommend this product - it looks fantastic! This bistro set is high quality - assembly is extensive but the instructions are clear and easy to follow. Good value and exactly as depicted. Very solid construction at an exceptional price. The table base is very heavy so I have no concerns about tipping. It was easy for me to put it together without help. All hardware and the necessary wrenches were included. No other tools were needed. I spent a very long time shopping in stores and online to find the right bistro set for my upstairs balcony. This set definitely delivers the value I was looking for. Table is way off level, very obvious. Problem seems to be with the cast base. "Adjustable" feet for leveling only provide about 1/4 inch of adjustment - we need way more than that. One of the chairs also arrived with one arm broken off in shipment. Sitting at the bistro table as I write this. High quality and very comfortable. Looks great on our deck. My wife and I love it! Love it! Very nice bistro table and chairs!! LOVE... LOVE... LOVE this set. Seriously these chairs are so comfy and spin. They are easy to put together also. I have 4 of the stools around my outside bar then I have one of the 3 piece bistro bar sets out there also to add to the bar area. I love this set so much I am going to buy one more soon!! Very nice set; heavy enough for outside use. Well packaged for shipping. Not too difficult to put together. This set is heavy and comfortable. I have had this set now for 2 years and I initially was bothered that I could see the bolts from the underside of the table but that was short lived. The chairs are so comfortable and roomy. My husband 6'2" 230 sits comfortably in these chairs. The table is a great size for the corner of a room. I ordered a piece of glass for the top and I use this set indoors. Love this set. Really very attractive. Enjoy sitting out in the evenings now while it's still a bit cool. Would definitely recommend this item. Loved the look and the finish. It looks as good as in the picture and it was easy to assemble. Very well packed with lots of bubble wrap but....there was a part missing! We were so excited to see how beautiful it looked but then disappointed about the missing part. We called customer service and are still waiting for the part. Great buy! We live in Florida and this stays out all year long. It is heavy enough to withstand the high winds we get on the coast and not blow over. Now we can sit and look at the water and not have our vision obstructed by the railing. Had it for 2 years and no rust. Purchased this a couple years ago and it still looks great! Very, very durable! I highly recommend it. I bought this set last year to place in the new pergola we installed and we can't be more pleased. It is durable, beautiful and sturdy. Highly recommended it! heavy set and great looking on our deck, perfect height for enjoying the views over the railing. Solid, no wobble, easy to assemble, beautiful. Choose this height for our front deck so that our vision would not be hampered by the railing that just happens to fall in the line of sight with regular chairs. We have placed a glass top on the table to reduce wine spills and tufted cushions to add a little tushcush. It is comfortable and durable and the perfect height. I am disappointed that several of the bolts that hold the tabletop to the legs have rusted. Great quality and very sturdy Looks fabulous on our outer deck Highly recommend!!! This seems to be a really well made set. We love it because the added height makes this set perfect for looking over the rail of our balcony. Really like this set, sturdy, attractive and I thought it was easy to put together. Took me longer to remove packing than it did to assemble. Throw away the junk tools that come with the hardware and use your own. Darker color than pictured and this is what I hoped for. Bought this plus two additional chairs. Looks great on our patio. Very good quality and heavier than expected. Delivered on time. Easy to assemble. Would definitely purchase again. "what is the weight limit on the stools "
There is no set weight capacity. However, we don't recommend anything heavier than 250 pounds for single seating items. "Is there an cancer %22 causing agent to be concern about with this bistro set"
"Color, when I think of copper I think orange. On my monitor the color looks more golden bronze underlay with maybe a black or brown stain over it. Can anyone be more specific about the coating color." It is a bronze-ish brown with a gold/brass wash color accents. "Is Santa Maria shine copper cast the same finish as Santa Maria bat stool?" "How can I put umbrella in when the table support bracket it solid in the middle but the table has a hole for it. Lucille"
Unfortunately according to the manufacturer, this table is no longer able to support an umbrella. "A question was asked a few years back regarding the size of the cushions needed for the chairs. The response was 19 x 19. Based on the description, the seat is 17 x 18.5. Can you give me accurate dimensions and the size cushion that is appropriate for this chair. Thank you"
17 x 19 or 19 x 19 would do.